The Ranas Bridal Collection gives you everything you need to wear for the perfect wedding look, right at your finger tips. India is a diverse country with each state having its own preference & taste for sarees, so one can imagine the plethora of stunning sarees. When the whole collection from every part of country is put together at display at one place called ranas.in. Indian Wedding Sarees include Embroidery Sarees, Banarasi Sarees (Varanasi Sarees), Patola Sarees, Kanjiwaram Sarees, Ikat, Gharchola Sarees etc. Most Popular Sarees amongthere varieties are Indian Embroiedery Sarees. Indian Embroidery is famous all over the world. There Embroidery consists of various techniques of embroidery such as Zardozi, Aari(Ari), Gota work, Kundan work, Bead work, Pittan work (Beaten work), Stone work, Wasli work, thread work, Applique work, Patch work, Mirror work, Sequence work and the list goes on. These Beautiful embroideries may be done on variety of sarees using various fabrics such as pure silk sarees, georgette sarees, Faux Georgette Sarees, Embroidered Sarees, Gota Work Sarees, chiffon sarees, crepe sarees, cotton sarees, tissue sarees etc. Fancy Embroideries are also done on exclusive traditional woven saris such as, Banarsi Silk Sarees, Banarsi woven Sarees, Gharchola (Ghatchola) Sarees, Kanjiwaram sarees, Further highlighting them to create a beautiful piece of Indian wedding saree. As of today sarees are the only preffered choice of every Indian women for most special occasions like wedding and parties. In recent years the world has recognized the charm & beauty of Indian saree. Today women all over the world have accepted saree as one of the most beautiful a hires. Beacause of such diversity of variety and price range it fulfills the need of every women. It is not only the bride who would wear an exotic saree but other family members like mother, sister, aunts everyone.. In India wedding is like a big festival. People get dremed in their most beautiful ethinic costumes and they mostly prefer sarees or lehengas. Due to this high wedding festivity vast ranges of wedding saree collection or Indian saree collection is available. These sarees are available in various styles and colours. 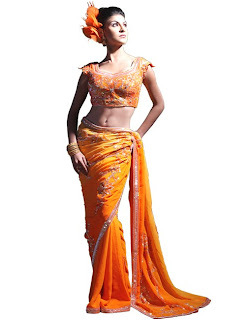 Recently half stitched sarees & lehenga sarees are in fashion. There sarees are available in all the colours but most popular are the bright color sarees like red, mehroon, pink, orange. Beautifull sarees are available in almost all the colours. You can get the most exotic collection in our online market at Ranas.in. Nice Blog on Indian Wedding Designer Saree. Thanks for sharing such a good stuff.